The At Peace Small White/Pink Pet Casket is a durable two-piece casket made of high quality plastic. The white interior of the casket is softened with a pink satin mattress and lace-edged pillow. A roll of sealing tape and instructions are included. Suitable for small pets measuring no more than 16 inches long from tip of nose to base of tail and weighing no more than 40 pounds. 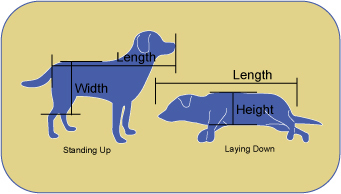 Length: Measure the pet from tip of its nose to the base of its tail. Width: Measure from the back of the pet to the area where the leg bends (knee joint of the pet). Height: Measure the pet from the outside of one shoulder to outside of the other shoulder. Usually ships same business day if order is placed before 1:00pm Eastern Time. Note: The 15 lbs is dimensional shipping weight and is not the actual weight of the casket. The casket weight is 6 lbs.